Philosophy- Our New Cumberland preschool program has been established to provide quality experiences for children three and four years of age. 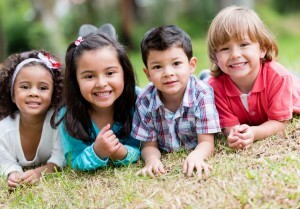 Our goal is to promote the emotional, social, intellectual, communicative and physical development of the child. We dedicate ourselves to nurture a positive self-image and a love of learning. Accredited Program: Our preschool program is held to the rigorous standards of the Pennsylvania Department of Education and the Pennsylvania Keystone Stars program for preschools in Pennsylvania. Our program is lead by teachers who have Bachelors degrees in Early Childhood Education and teaching certificates from the Pennsylvania Department of Education. Circle Time- Every morning the class comes together in a structured and fun way. It is social interaction, music and discussion. Every morning the group participates in calendar, weather, helper jobs and theme related activities. Circle time allows the children to learn to take turns, extend their listening skills and work cooperatively. Basic Skills – These are taught through the curriculum Subject areas include Math, Language Arts and Social Sciences. Examples of Math concepts include counting, one-to-one correspondence, shape and color recognition, more or less, size discrimination and matching. Examples of Language Arts concepts include whole language activities that involve listening to and retelling stories, alphabet recognition, name recognition and answering questions. Examples of Social Science concepts are learning about the world around them (careers, wildlife, transportation, etc.). This area also includes learning about the child’s self, their similarities and differences with their classmates and family life. Teachers work with the children to introduce these concepts and reinforce them as needed. Children are observed daily by their teachers for growth in all areas. Authentic assessments are completed in October, January and May to give both staff and parents a clear look at how their child is developing. Conferences are offered to discuss growth, areas of strength and areas needing more practice.